Cultural Landscapes Blog›WP5: How can we maintain our cultural landscapes in the future? At a European scale, it is often assumed that the level of globalization and the level of governmental regulation assemble the processes that change landscapes. We analyzed which land change trajectories could influence cultural landscapes under extreme scenarios of these two main drivers. This study showed that cultural landscapes, characterized by their special structure, low-intensity use, and meaning to society, are more prone to change than other landscapes. Particularly decrease of intensity, eventually devolving into abandonment, is a large risk in remote cultural landscapes. More accessible cultural landscapes are clearly more prone to urbanization and peri-urbanization than other landscapes. The assumed level of governmental intervention and focus on globalization make a large difference. Especially a regionally focused scenario limited abandonment and peri-urbanization in cultural landscapes. To find out how these changes work out on the ground in “real” landscapes, we went to two classical European cultural landscapes where we simulated changes in the local landscapes under a few contrasting scenarios. The scenarios combined factors influencing the region externally with local initiatives. Devon in Southwest England, characterized by its extensive hedgerow network which is highly valuable to society, and Lesbos in Greece, characterized by traditional olive farming on stone terraces. In both landscapes, farmers are struggling to obtain sufficient income from their farms. 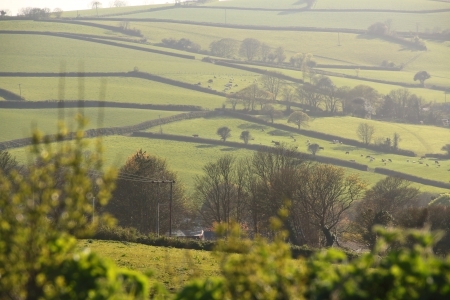 In Devon, scale enlargement is ongoing and expected to continue the coming decades, which goes at the cost of the hedgerows as production driven farmers tend to be less careful in their hedgerow management. A future scenario with restrictions on the land market and more attractive agri environmental schemes could reduce, but not reverse, the hedgerow decline. Only when combined with a local initiative where biofuel production from hedge clippings made hedgerow management more attractive, hedgerow quality can be maintained or increased. In the Lesbos case, the lack of profitability of the olive farming triggers farmers to quit farming or to abandon their fields. Maintaining subsidies can limit the abandonment, but only scenarios with integrated landscape initiatives, taken through the whole olive sector, can reverse the abandonment, and with that support the continuation of traditional olive farming. In both landscapes, the scenarios were discussed with stakeholders who recognized that both the contrasting, extreme situations were realistic. Both in the study landscapes and at European scale, the policies influencing the land managers or the land use changes had a strong impact on the simulated future landscapes. In both case studies, a combination of external regulations and locally specific policies could reverse the trend of loss of landscape quality and in the European scale scenarios, the scenarios with a high level of governmental intervention accomplished the same. These studies at two different scales suggest that maintaining cultural landscapes as productive, living landscapes that retain their value to society, is favoured by a policy framework that enables or stimulates region specific solutions. (cf. Baudry, J., and Jouin, A., 2003, De la haie au bocages. Organisation, dynamique et gestion. Paris: Editions de l'INRA, as a starting point). reconciliation of modernity with the conservation of traditional landscapes. The Dutch have used modern drainage improvements to maintain or restore traditional features of the landscape.